This Italian medium tank fought against the British and Commonwealth 8th Army forces in the North African desert war of the early 1940s. The M14/41 was essentially an improved version of the M13/40 which was Mussolini's most promising tank designs of the early period of the desert war in Libya and Egypt. Although there are visual differences between the two tanks. 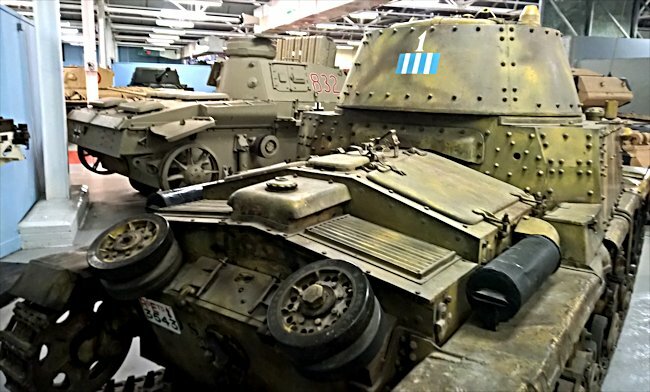 Changes on the production line were introduced in stages so you can find examples of M13/40 tanks with features commonly associated with the M14/41 medium tank and visa versa due to old spare parts being fitted to the newer tanks. 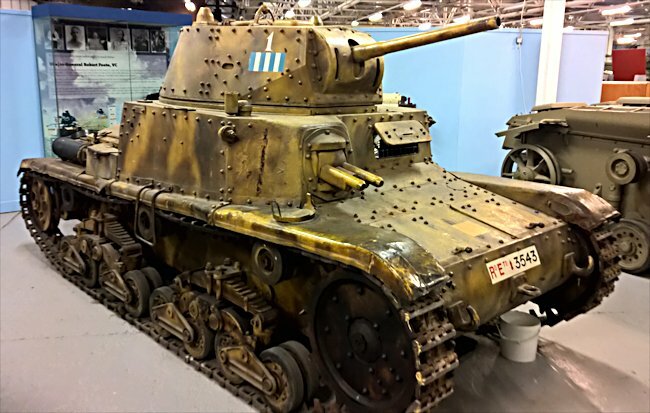 The Carro Armato M14/41 tank at the Tank Museum in Bovington is one of the latter examples. Its mud scraper behind the drive sprocket, is a reliable identification feature of a M14/41 and the uprated Spa 145hp V-8 diesel engine but other features, such as the location of the jack is typical of the earlier M13/40 tank. When the M13/40 tank first appeared in North Africa in 1941 it was probably equal to its British counterparts in terms of firepower. It's 47mm gun was very similar to the British 2-pounder gun fitted to most of their tanks. 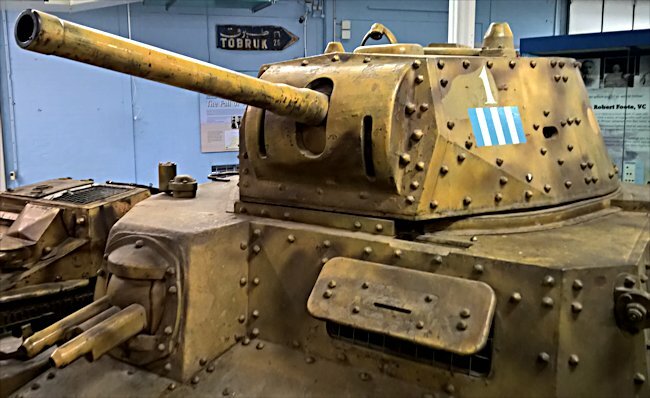 Where the Italian tank design failed was on its armour plating. It had a tendency to crack under fire. The reliance of the cheaper riveting and bolting method of construction rather than welding had fatal consequences. Fractured rivets, after being hit by a British shell, bounced around the inside of the tank and went straight through any flesh it came in contact with. The Italians had more experience in desert conditions than the British yet they still produced a range of tanks that were underpowered and unreliable in hot desert conditions. The engineering alterations made to the Carro Armato M14/41 were designed to cure some of these problems. A more powerful diesel engine was installed in the engine compartment. It used the same chassis as the m13/40 but additional armour was added to give better protection. Productions started in 1941 but ended in 1942. Around 800 Carro Armato M14/41 tanks were produced but they were obsolete by the time they arrived on the field of battle. They could not compete with the upgraded and newer British and American Lend-lease tanks that were sent against them. Where can I find preserved Carro Armato M14/41 Italian tanks?